26 North Yachts has announced the opening of a new sales office at Bentley Bay Marina in Miami Beach. 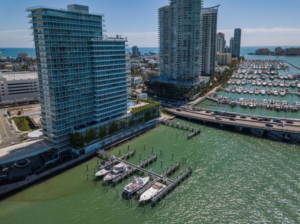 The industry-leading, boutique yacht brokerage firm’s new office, set to open on August 1st, is strategically located in the heart of South Beach, greatly expanding the company’s presence in the South Florida yacht brokerage and charter markets. The company plans to hire up to six additional brokers over the next year for this location. Located immediately north of Miami Beach Marina at 520 West Avenue, the new office features work space, a sales floor, reception area and a VIP client lounge. Adjacent to the sales office is an 18-slip marina, allowing the company to show boats to clients and offer them premium dockage at favorable rates. For brokerage services, dockage, employment opportunities and media inquiries please contact Will Snyder at 954-235-3468 or will@26northyachts.com or visit 26northyachts.com. Based in the yachting capital of the world, Fort Lauderdale, Florida, 26 North Yachts is an exclusive brand providing the most professional and private yacht brokerage and charter services available. Launched in 2010, the company’s commitment to excellence is found in its highly-attentive client communication and its ability to provide clients with information instantly, as expected in today’s fast-paced market. The company’s advanced marketing techniques and extensive database differentiates it from other brokerage houses in the industry, resulting in a successful sale for both buyer and seller. For more information about 26 North Yachts, call (954) 900-9988 or visit 26northyachts.com.